On a new, hilly venue in Louisville, Kentucky, Katie Compton and Stephen Hyde, take convincing wins in final round of US Cup-CX. 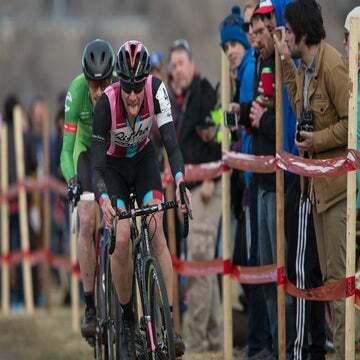 LOUISVILLE, Kentucky (VN) — On a new, hilly venue in Louisville, Kentucky, Katie Compton and Stephen Hyde took convincing wins in the US Cup-CX/Derby City Sunday. Kaitlin Keough was second and Crystal Anthony finished third in the women’s race. Gage Hecht and Kerry Werner were second and third, respectively, in the men’s race at Joe Creason Park. Clif Bar’s Maghalie Rochette took the holeshot. Compton (KFC Racing/Trek/Panache) was quick to take charge, moving to the front on the first lap. Soon it was just her and Cannondale-CyclocrossWorld.com’s Keough in the lead. A chase of four followed, including Anthony (Maxxis-Shimano), Ellen Noble (Aspire Racing), and Keough’s Cannondale teammate Emma White. One the course’s lone paved climb, Compton got a gap on Keough and quickly extended it to 15 seconds after another lap. Behind, Noble and Anthony were battling for the last spot on the podium. At one point, Noble took the upper hand after cleanly riding the course’s stone stairs. However, a lap later, she bobbled, and Anthony got away to ride solo to third. “I like to ride things if I feel like they’re faster,” Noble said. “For me, I’m not a bad runner, but I’m not as quick as I’d like to be. For me to ride it is easier because I’m recovering instead of running. Meanwhile, Compton kept the pressure on all the way through to the finish, riding to a convincing solo victory. “It’s a hard course,” Compton said. “So far I think the better is better than the other venue,” she added, referring to Eva Bandman Park, where Louisville had previously hosted the Derby City Cup. She’ll try to defend her Pan-American Championship title Sunday as racing continues in Louisville. Four riders went off the front on the first lap of racing with Cannondale-CyclocrossWorld.com’s Hyde leading the way. He was joined by Kona’s Werner, Alpha Bicycle’s Hecht, Fernando Riveros (Stan’s NoTubes), and Tobin Ortenblad (Santa Cruz-Donkey Label). Going into the second lap, Riveros crashed right off of the start straight. “I was like ‘Where am I?’ because I hit my head. That’s why I couldn’t keep up with those guys,” Riveros said. He rode back to the group but was dropped on the next lap, feeling the effects of the impact. After three laps, Hyde and Hecht rode clear. The duo didn’t last long. Hecht suffered a puncture on the fourth lap and had to grab a pit bike after riding two of the course’s main climbs with a flat. “I think I hit a rock too hard on that big drop,” Hecht said. “The road climb wasn’t so bad because carbon on road is like pretty fast! Hecht drifted back to the group and then escaped in the final laps to finish second alone. Werner out-sprinted Ortenblad to round out the podium. Werner out-sprinted Ortenblad to round out the podium. “This is the best racing we’ve seen in years. This is amazing,” Hyde added. 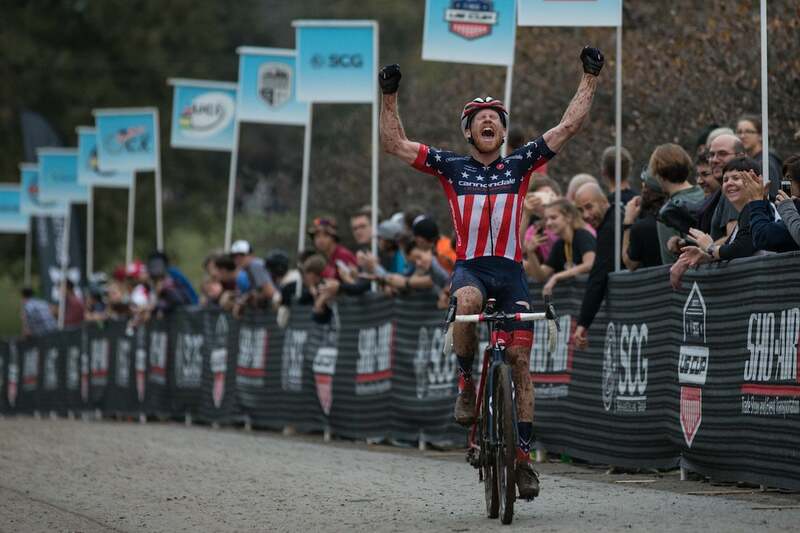 With his fourth win in a row, he easily won the Sho-Air US Cup-CX series. “It’s not necessarily all because of the series but a huge chunk of cash helps. Like Compton, Hyde is the defending Pan American champion and will be a top favorite Sunday.